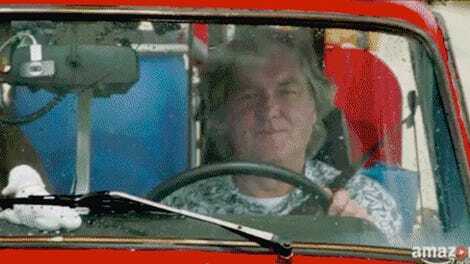 Somehow, between Richard Hammond busting up his leg in a car crash and Jeremy Clarkson nearly dying from pneumonia, The Grand Tour managed to film a TV show. There’s extra photo evidence of it if you’re skeptical, or if you just want to see what these dudes will be doing in the new season. It’s hard to tell how early of a look these photos are, considering the fact that we don’t know when the show will be out other than it’s “coming soon.” There’s not a set date for its release yet, but the general consensus is that the first full episode will be out this fall. First, here are the three of them stuck in mud. There’s the odd pairing of a Mercedes-Benz W123, what we Americans like to call a Nissan Frontier, and Hammond looks like he’s on... a bike? With ski goggles and a wooden cross? Then there’s almost the same group doing what looks to be a different challenge, except it looks like the XJS didn’t make it. Safety third. There will also be a segment of Hammond’s Rimac Concept One supercar crash from the summer, as teased in a video trailer a few months ago.